Ankylosing spondylitis is a type of progressive arthritis that inflames the joints of the spine. Ankylos is Greek for stiffening of a joint, and spondylo is Greek for vertebra. A word association that might help make the name stick is to think of the “sp” in spondylitis and associate the word spine. A common expression might also help. Instead of thinking “Oh, my aching back,” think “Oh, my ankylosing spine.” Silly? Perhaps, but it works for some. Ankylosing spondylitis belongs to a family of similar arthritis types known as seronegative spondyloarthropathies. That means a blood (sero) test for the presence of rheumatoid factor is negative. Rheumatoid factor is an autoimmune antibody that, if present in a blood test, confirms a diagnosis of the systemic condition known as rheumatoid arthritis. 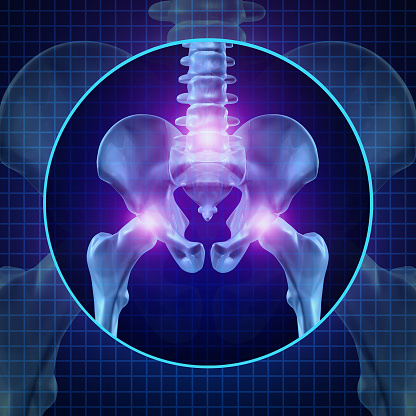 Seronegative spondyloarthropathies include ankylosing spondylitis, psoriatic arthritis, arthritis of inflammatory bowel disease, chronic reactive arthritis, and a type of juvenile arthritis. Ankylosing spondylitis (AS) is associated with “sacroiliitis,” or inflamed sacroiliac (SI) joints. The sacroiliac joints are where the spine joins the pelvis. Although AS usually is concentrated in the SI joints, AS affects some sufferers by affecting joints in the shoulders, ribs, hips, knees, and feet. AS also can inflame the tendons and ligaments connecting to bones. More rare, but possible, is involvement of other organs such as the eyes, bowel, heart, and lungs. AS symptoms typically begin in early adulthood, more often in males than females. The major symptom is back pain, which can range from mild, temporary discomfort to severe, persistent pain and stiffening of the spine. Persistent inflammation can cause calcification that leads to fusion of two or more bones of the spine and, less frequently, the rib cage. Fusion of bones in the spine can cause immobility and a fixed, forward-leaning posture. Fusion of the rib cage can restrict the space in which the lungs must expand, thus compromising inhalation capacity and lung function. When onset of AS occurs during childhood, symptoms start in the hips, knees, or heels, and later in the spine. Prevalence statistics vary among sources. The Arthritis Foundation asserts that a half a million people in the US have AS, which would correlate roughly with a city the size of Sacramento. A study by Dean and colleagues in 2014 found that in North America, 31.9 persons per 10,000 people have AS. Johns Hopkins Arthritis Center estimates that the prevalence of AS in the US is about 0.2-0.5%. What do those numbers mean? They essentially mean that AS is somewhat rare, but it’s important to keep in mind that AS is life-altering for those who have it.